Preheat the oven to 350F. Line 2 muffin pans with cupcake liners. In a medium bowl, whisk together the flour, baking powder and salt. Set aside. In a separate, larger bowl cream together the butter and sugar with an electric mixer until light and fluffy. Beat in eggs, two at a time, until all are incorporated. Mix in the mashed banana until combined. Slowly add the dry ingredients and buttermilk, working in two batches until just incorporated. In a small bowl, stir together strawberries and powdered sugar. Let the mixture macerate for at least 30 minutes, tossing a few times. After they have sit for 30 minutes, mash them with a fork against the side of the bowl. To fill the cupcakes, use a paring knife to cone out the center of the cupcake. Fill each cupcake with a tsp or two of strawberries then top with a tsp or two of pineapple. In a large bowl, whip heavy cream with an electric mixer until soft peaks form. Add in powdered sugar and continue to whip until stiff peaks form. Cafefully fold in vanilla extract. Place whipped cream frosting in a large pastry bag fit with a plain, large, round tip. Pipe a swirl on each cupcake, covering the filling. Place cupcakes in the fridge for at least 30 minutes to chill. Place chocolate in a heatproof bowl. Gently heat cream in a small saucepan until simmering and immediately pour over chocolate. Let stand for 1-2 minutes. Stir cream and chocolate until smooth and then stir in the corn syrup. Let stand for 10-15 minutes until it has cooled but is still a pourable consistency. Pour a spoonful or two of ganache over each cupcake. 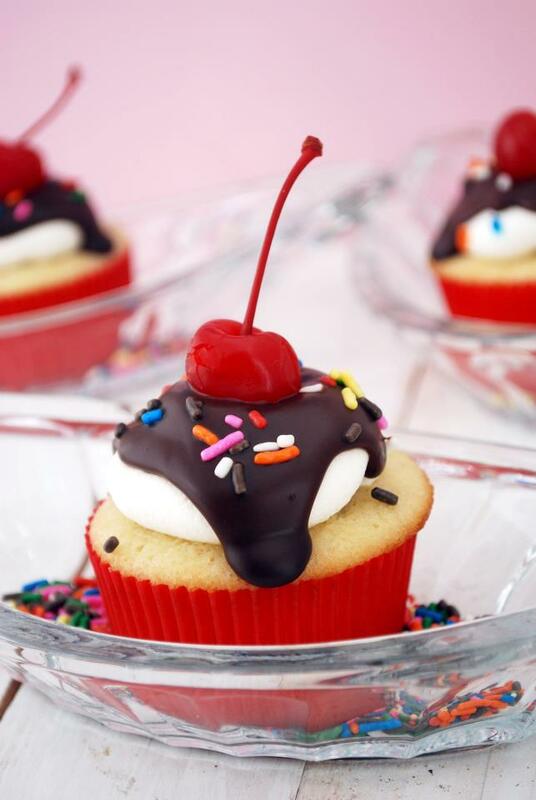 Top with sprinkles and a cherry. Immediately return the cupcakes to the fridge and let set for an additional 30 minutes before serving. If you aren’t serving them immediately, they will keep in the fridge for several days.